I love holiday's and Valentine's Day is one of my favorites. This year I decided I wasn't going to get behind on creating stuff for the occasion and I've already gotten cards and frames done so I'm happy about that. This is a an image of the first two frames I've completed and I must say I'm very pleased with how they turned out. I painted them and added some scrapbook paper and ric rac and my little quilled lovebirds, I'm definitely going to make more - might even make one for me - something I never do. 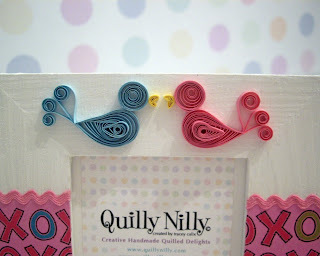 I have no quilled creations in my house, weird huh? 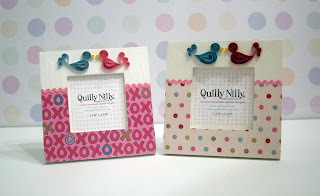 The frame with the xoxo lovebirds is available through my etsy shop, the other one is going into my shop here in town and as mentioned there will be more on the way. awww these are tooo cute! and you're good! i havent even started to think about valentines day yet! guess i better get cracking! I love those little birds..how precious. Well done!! These are amazing and so cute!! I love them!